At first, I thought the morph suit would be an adaptable costume that could be altered/changed for next year! Now that you’ve described it so well, all I can picture is a Navy frogman from the old war movies I watched as a kid. Then I remembered I had seen on at a college football game. 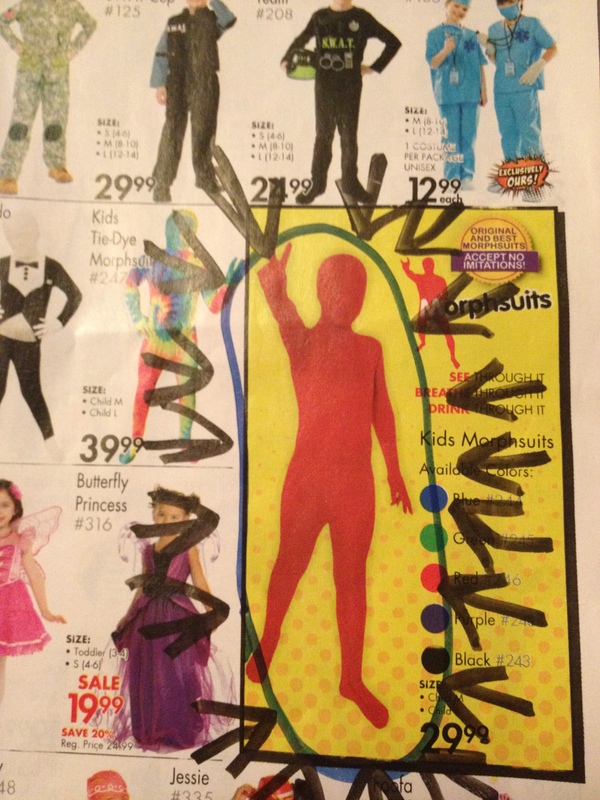 It was creepy…..
came across your blog looking for tips on altering my husband’s morph suit. We are big on the cosplay community and see morph suits at every convention we attend. In fact this is my husband’s second morph suit and he’s a larger guy. But despite this the lycra in the suit hold him.all in and he doesn’t look chubby or disturbing at all. Now you do have to watch what you wear under them if you don’t want to see lines. This year were opting for a dance belt, which is what male ballet dancers use to hold their “parts” in.. So while I don’t feel the need to say no to a silly costume such as a morph suit I respect your decision for your child.